lunch special served with salad. 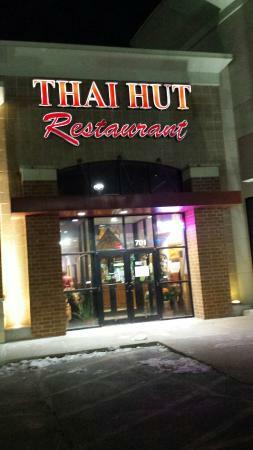 lunch special served mon - fri from 11:00 am to 2:00 pm, saturday - sunday from 12:00 pm to 3:00 pm. substitute with shrimp add - $2, substitute white rice with brown rice add - $1. sautéed chicken with carrots, mushrooms, pineapple, onion, peppers, and cashew nuts. stir-fried chicken, pork, or beef with ginger, onions, peppers, and mushrooms in a mixture of tangy flavor. stir-fried with green beans, eggplants, onions, peppers, and basil leaves. sautéed chicken and mushroom in garlic sauce, topped with green onion and cilantro over bed of cabbage. stir-fried chicken and assorted vegetables. sautéed with mixed vegetables and cashew nuts in thai hut special sauce. stir-fried rice with eggs and onions. stir-fried thin rice noodle with egg, cabbage, bean sprouts and green onions, topped with ground peanuts. stir-fried rice noodle with onions, peppers, eggs, tomatoes, bean sprouts and basil. barbecued chicken breast with house special sauce, served with stir-fried vegetables and cashew nuts. 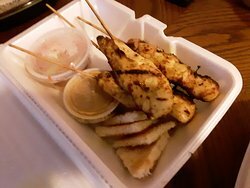 grilled chicken skewer marinated in light curry, served with our famous peanut sauce and cucumber salad. deep-fried crabmeat with cream cheese wrapped in wonton skin. (deep fried) vegetables wrapped with delicate rice wrapper, served with sweet and sour sauce. deep-fried fish mixed with chili paste, served with sweet and sour sauce and cucumber. 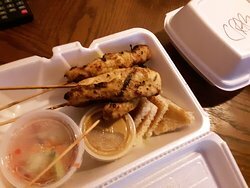 daily made fresh vegetables, fried tofu, scramble eggs, wrapped with spring roll skin, served with peanut sauce. deep fried tofu, served with sweet and sour sauce, topped with crushed peanuts. deep-fried dumplings filled with blended shrimps, potato starch and chopped onions, served with special sauce. thin pastry stuffed with pork and vegetables, served with special sauce. shrimp wrapped in bacon, served with sweet and sour sauce. deep fried ground shrimp and pork mixed with seasoning wrapped with rice wrapper, served with sweet and sour sauce. delicious thai style hot and sour shrimp soup, flavored with fresh lime juice, lemon grass and mushrooms. hot and sour chicken soup, flavored with galanga, mushrooms, lemon grass and fresh lime juice in coconut milk. delicious soup with shrimps, imitation crab meat, chicken and mixed vegetables. exciting hot and sour soup with combination of seafood, mushrooms, lemon grass and fresh lime juice. assorted fresh vegetables with chicken and egg, topped with chef’s special dressing. 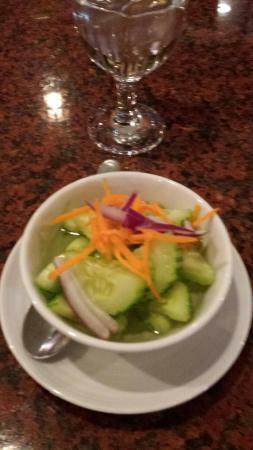 fresh sliced cucumber, carrots, and onions with sweet and sour dressing. assortment of fresh vegetables, served with our house dressing. the combination of seafood with herbs in tangy lime juice dressing. julienne fresh green papaya, carrot, tomatoes, roasted peanut and thai sauce. roast beef with herbs in tangy lime juice dressing. ground chicken with herbs in tangy lime juice dressing. substitute with shrimp add - $2, substitute white rice with brown rice add - $1. sautéed chicken with cashew nuts, pineapple, onion, peppers, mushrooms, and carrots. tir-fried with ginger, onions, peppers, and mushrooms. stir-fried with eggplants, green beans, onions, peppers, and basil. sautéed with garlic and mushrooms, topped with green onions and cilantro over bed of cabbage. stir-fried combination of mushrooms with broccoli and cauliflower. stir-fried with broccoli, cauliflower, and peanut sauce. deep-fried chicken, pork, or beef with cucumber, tomatoes, carrots, onions, peppers and pineapple in sweet and sour sauce. stir-fried beef with eggplants, peppers, onions, and mushrooms. 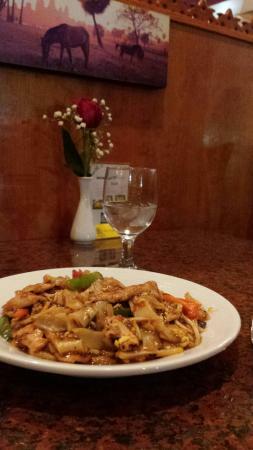 stir-fried with vegetables and cashew nuts in house special sauce. stir-fried with eggs, broccoli, cauliflower, carrots, celery, napa, mushrooms, and onions. crispy fried chicken with cucumber, onions, tomatoes, peppers, carrots, snow peas and pineapple with in house sauce. giant shrimps grilled to perfection, served with sautéed vegetables in special house sauce, topped with cilantro. an incredible stir-fried combination of chicken, shrimps and imitation crab with mixed vegetables and cashew nuts. barbecued baby back ribs, served with special fried rice. crispy fried chicken with white sesame, carrot and in house special orange sauce. sautéed shrimps, scallops, squids, imitation crab, fish fillet, and vegetables in spicy sauce. green mussels on half shell sautéed with mushrooms, onions, and bell peppers in spicy chili sauce. crispy fried fish with cucumber, tomatoes, carrots, onions, peppers, and pineapple in a rich sweet and sour sauce. crispy fried fish with peppers, onions, and cilantro in a triple flavored sauce. red curry sautéed with peppers, bamboo shoots, green peas, eggplants and sweet basil leaves in coconut milk. 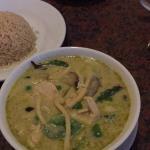 green curry with bamboo shoots, eggplants, green peas, peppers, and sweet basil leaves in coconut milk. combination of seafood with curry paste, eggplants, peppers, green peas, bamboo shoots and sweet basil leaves in coconut milk. an aromatic curry stew made with panaeng curry, peppers and peanut sauce, simmered in coconut milk. crispy salmon top with curry paste, broccoli, cauliflower and peppers in coconut milk. thai red curry with roasted duck, tomato, grapes, peppers and pineapple. yellow curry sautéed with onions, potatoes in coconut milk. stir-fried rice with basil sauce, basil leaves, onions and peppers. stir-fried rice with chicken, shrimps, imitation crab, eggs, onions, corns, green peas, carrots, and raisin. famous fried rice with shrimps, chicken, eggs, onions, corns, carrots, green peas, raisin, cashew nuts, and fresh pineapple, served in fresh pineapple bowl.